Today we had another fun day of co-treat sessions. I’ve mentioned our lunch groups previously; today highlights a typical, traditional speech and OT group. Today’s group was comprised of six kindergarten aged students who all receive speech/language, OT and resource. Our group time is 30 minutes. In addition to the speech room, Kat (the OT) and I share a classroom for treatment. This group takes place in a classroom. Here is a breakdown of how we run a typical group. 2. Students transition to the next area. Today it was to the carpet to read There Was An Old Lady Who Swallowed a Chick. Yes, we did have the Easter dilemma. Sometimes we change the words to Spring Bunny but since all of the students celebrate Easter we went with Easter Bunny. Sometimes we read at a table, sometimes we read on the carpet. We try to keep a routine with some variability. We want kids to rely on the language and not just the routine. Students take turns feeding the old lady, nicknamed “Granny” by one of students this week. Funny how the kids never get tired of “feeding” the Old Lady and anyone or anything for that matter. 3. We use a transition question to move to the next area for the next activity. Today students had to recall an item that she ate. Students aren’t allowed to repeat what another student has said so they need to listen to each other. Sounds simple but this can be a challenge for many of our kids. They are learning that this is a group expectation. 4. 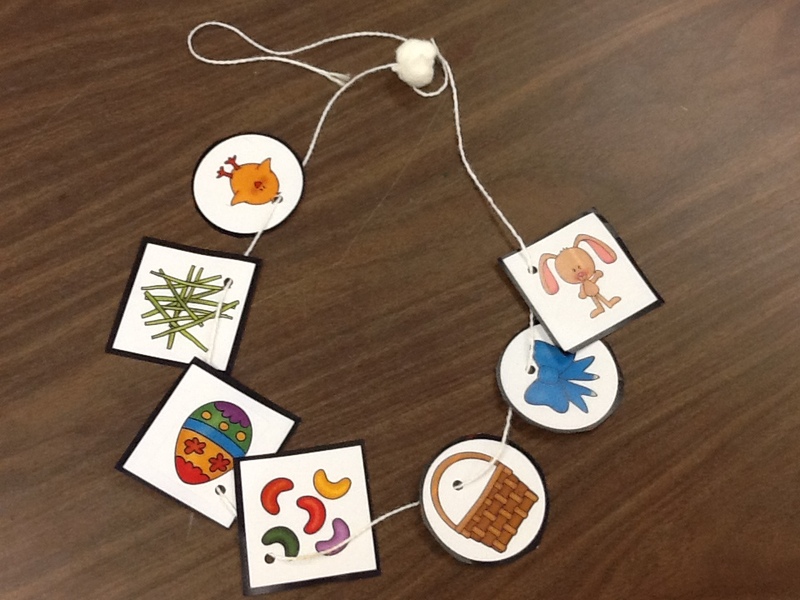 Today we borrowed a great idea from Katie from playing with words 365 Sequence necklaces! Graphics are courtesy of her site. First we had the students cut all the pictures of the items the Old Lady swallowed, in the correct sequence. As a modification for those students who have trouble cutting, we imported the pictures into Boardmaker and surrounded them with a bold outline, giving children a better visual of where to cut. 5. Next the students sequenced the pictures onto a necklace. 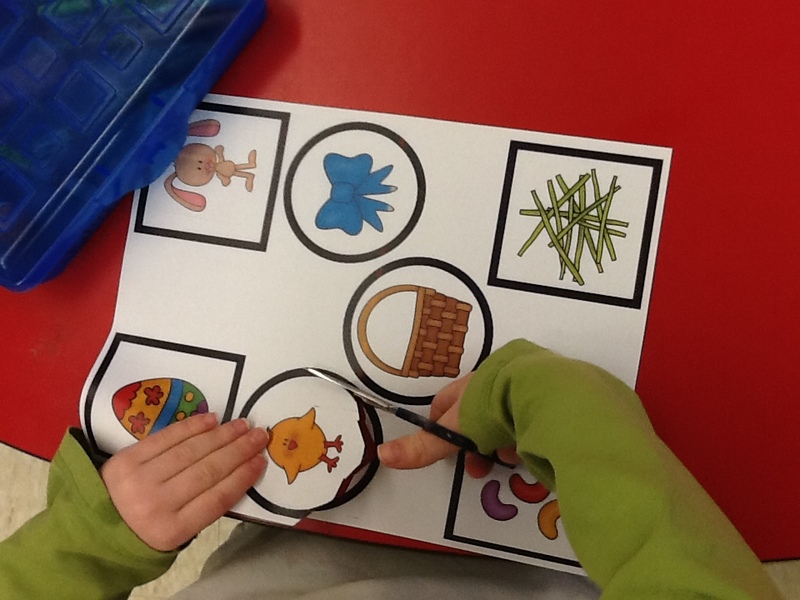 Targets include: sequencing, fine motor for threading and following directions. Notice the cotton ball to hold the pictures in place on the end of string…feels a little better than a string knot on the back of the neck. 6. If we had the time, we could have had the students re-tell the story using their necklaces. Where does 30 minutes go?? Truth be told, we probably started late and went over late so it all works out. 7. Sometimes we have the students fill out a journal sheet to report on what they have done. Sometimes we send home a sheet completed by us so that the parents can ask about the session with their child. Here you can find a copy of the sheet completed by us: speech OT group communication. Feel free to copy for your own use or adapted use. Why do I love co-treating with the OT? Well, first of all she has made me a better therapist. I now consider sensory, motor and regulatory needs in a way that I didn’t when I first started out. (That wasn’t on the grad school syllabus when I was in school). When you have that moment when a student accomplishes an anticipated skill for the first time there’s someone there to share the joy. When I’m feeling like the well of ideas is dry, Kat is there to fill it up and vice versa. No matter how good we are, we can’t see everything in a session. It’s always nice to have another set of eyes when reflecting on how the session went and what to do for next time. I could go on but I’ll save some more for next time.. I love this activity!! This site is great for parents to see how the activity happened from beginning to end. Thank you for sharing! Great! Thanks for the feedback Kara!